Baldev is the watchman of a daak bungalow in a small rural village. He is a bit on the naive side, and the other villagers easily take advantage of his innocent, open-hearted nature. His best friend Naubat (Mukri) tries to prevent him from being exploited, but Baldev really just doesn’t mind. 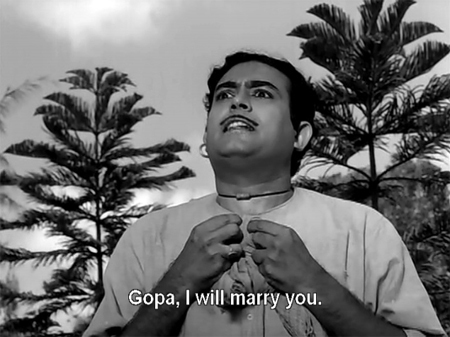 He is happy being useful, and the only thing he wants for himself is pretty Gopa (Zaheeda). With Naubat’s support he finally works up the courage to propose marriage to her (well, sort of). To his great joy, she agrees and we are treated to the first of many lovely songs, “Dulhan Se Tumhara Milan Hoga” as Baldev cleans his house in anticipation of his bride’s arrival. As the song fades, he draws a lace curtain across his window and slams it shut, and the credits begin to roll against a backdrop of elaborate western objets d’art on which an unseen person’s hand is hanging small tags. Many kudos and pranams to you, Pandit Anand Kumar! 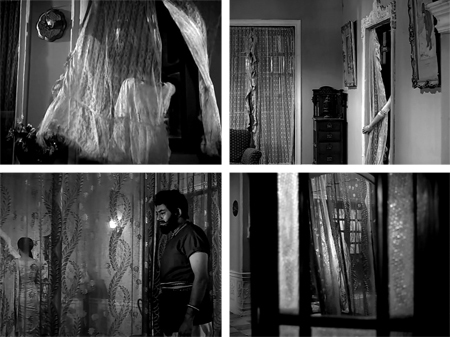 (And to director Asit Sen.) I mention the lace curtain because curtains are a recurring motif in this film: they veil, they reveal, they let in, they shut out, they are barriers between people. The various statues and vases belong to wealthy old Dwarkaprasad (Badri Prasad)—there are lots and lots of them crammed into his large mansion: it reminds me a bit of the much shabbier Marble Palace in Calcutta (one of the most loony and heartbreaking museums anywhere, also described pretty accurately here: “is place of drama and dilapidation”). And yes, I have been dying to work the Marble Palace into a post ever since I went there. In the sunset of his life, wheelchair-bound Dwarkaprasad finds himself in debt to businessman Madanlal (Tarun Bose). Unable to repay the debt (incurred by his late son), he is prepared to auction off his house and everything in it. 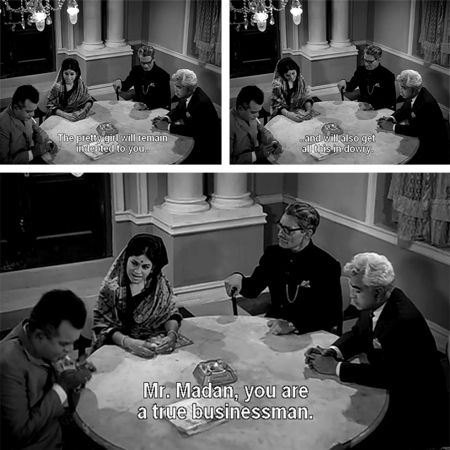 Madan arrives with his lawyer (Brahm Bhardwaj) and tells Dwarkaprasad that he will cancel the debt if Dwarkaprasad’s granddaughter Rama (also Zaheeda) will marry him. 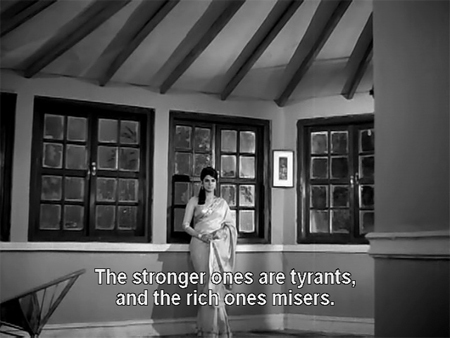 The old man dismisses this idea angrily, but Rama herself has other ideas. She unhappily agrees to the marriage. Her grandfather pleads with her, frustrated at his helplessness but she is adamant and tries to cheer him with the beautiful “Mehlon Ka Raja Mila” (this is now my favorite Lata song). Their elderly servant Ramdas (Anwar Hussain) stands by miserably, equally helpless. Outside, rain begins pouring down as a car arrives, bringing Rai Sahab (Amar?) and his much (much) younger wife Prema (Aruna Irani) for the auction. Rai is an old friend of Madan and the lawyer, but Prema is caustic when she discovers why the auction has been cancelled. As the storm worsens, Madan introduces Rama to his friends and she welcomes them. He is less pleased when a handsome young painter-slash-singer (Parikshat Sahni) arrives, seeking shelter from the storm, and she welcomes him too. 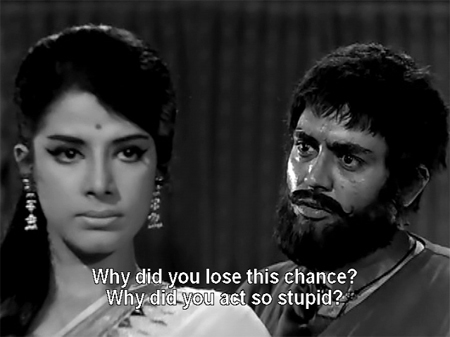 Madan tells him to leave, in fact, but Rama puts her foot down. Rai Sahab is not pleased either when Prema offers the artist a lift home after dinner. He asks Ramdas why there are labels on everything. A few minutes later, Rama tells him that they will not now be sold, and that she has been sold instead. Dinner is served, and the Painter (he never tells them his name) sings a song and does a lovely drawing of Rama in payment. The lawyer suggests that Rai Sahab and his wife stay the night since the rain shows no signs of letting up, and Madan takes the opportunity to tell the Painter to leave again. This time he does, after giving Madan some words of wisdom. Rama lets him go regretfully when he insists, but a few minutes later the doorbell chimes again. Cursing, Madan goes to the door prepared to do battle with the Painter, but instead he is kicked in the chest—and a gang of dacoits bursts in. The leader is startled when he catches sight of Rama. The bandit chief is none other than Baldev, whom we last saw preparing for his wedding. 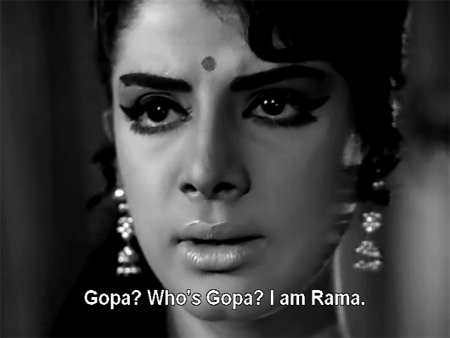 He approaches Rama and calls her Gopa. He retreats at her denial, but clearly remains fascinated by her. The plot thickens when the Painter returns minutes later for his forgotten bag, and is ordered to stay put by Baldev. Old Dwarkaprasad is positively gleeful at the sight of his new guests. 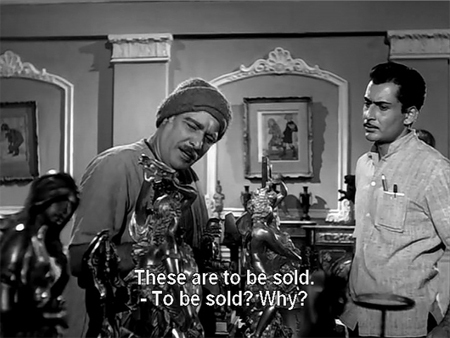 Baldev is somewhat insulted at his obvious lack of fear, but Dwarkaprasad says that he’s met worse robbers, and he tells Baldev how his son borrowed 20,000 Rs from Madan’s father, and due to exhorbitant interest rates the debt grew to 1.2 lakh. 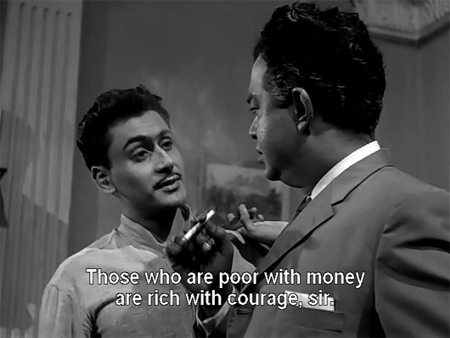 Madan doesn’t see at all that he uses his money in the same way as the dacoits use their guns, as a means of controlling the helpless; the irony isn’t lost on the Painter though. As the stormy night wears on, the Painter occupies himself with drawing portraits of the house’s occupants and we discover that there is a price on Baldev’s head to the tune of 1.5 lakhs—enough to bail Dwarkaprasad and Rama out of their troubles. 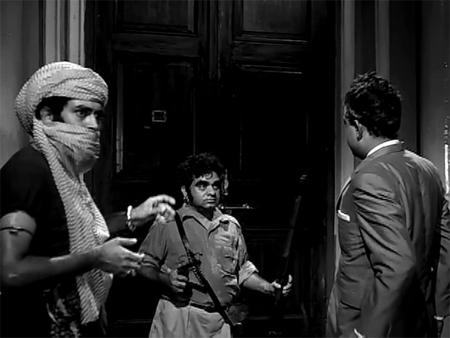 When faithful servant Ramdas seizes the opportunity to grab Naubar’s pistol, though, Rama prevents him from using it and allows Baldev to regain control. I personally think this is carrying hospitality a little far, but I probably wouldn’t marry a man I hated for my grandfather’s sake either (especially when it made him miserable too). Baldev is curious about her motivations, but she is enigmatic, saying only that different people have different principles. This could have annoyed me considerably, but the film isn’t about female sacrifices: although they loom large, they are not presented as a cure. Prema’s story (which we are told through a flashback) illustrates vividly the pain suffered by women when they are treated as objects. The film is about societal ills; sadly, it seems to me that nothing much has changed, and it’s not a problem limited to India (yes, I am a cynic—or a realist, depending on who you talk to). The Painter says too that poor people are apathetic about their poverty and oppression; that rather than doing something about it, they prefer to elevate themselves by then mistreating people even worse off than they are. Ouch! All this solemnity is mitigated here and there by some very funny scenes and little moments, mostly thanks to Mukri. 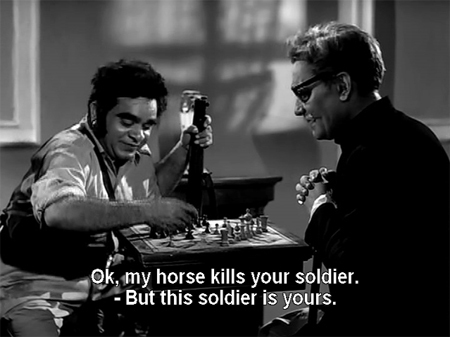 There is a rubber snake gag that makes me laugh, and Naubat plays chess with Rai Sahab—hilariously giving himself do-overs (mulligan!) when Rai Sahab points out his errors in judgment, although they quarrel when Naubat moves his pieces according to his wishes and not the rules. How will all this end? Who is the Painter? What is the story behind unhappy Prema’s marriage to Rai Sahab? What happened to transform Baldev from the simple, happy man we met at the beginning to the fierce dacoit now before us, and what has happened to Gopa? And what of Rama—will her future be auctioned off? I don’t feel I have nearly done this film justice: it just needs to be seen. There is no waste, not a moment or dialogue or character. Sanjeev’s performance is absolutely wonderful. He is both Baldev the simple villager and Baldev the dacoit, and he very believably blends both men into one. It can’t have been easy! Parikshat Sahni too carries the moral weight very ably on his (very handsome) shoulders. I have rarely seen comedy used so deftly in a film which is emphatically not a comedy, either. Plus, the whole experience is a sumptuous treat, the textures and lighting complementing the richness of the story beautifully along with the seriously gorgeous songs. Do look them up, you won’t regret it. Also, if you are interested in knowing how Tarun Bose got his start in films, see his daughter’s comment here: it’s very interesting! And finally—curtains. Lots and lots of lace curtains. Maybe symbolic, maybe the set decorator just had a lot of lace on hand. Either way, pretty. Posted on January 10, 2010 at 11:16 am in Hindi movies	| RSS feed You can skip to the end and leave a reply. The whole movie is unfolding in front of me now – and indeed it is a really good movie. It is very much about societal ills, but unlike in many other movies, here it is packaged in a very compact manner and therefore hits you harder. Each character (and they are all very good) has a story of his own, it all happens inside one building one stormy night, the tension can be cut by a knife at times. Ah, I now remember this movie very well. And of course the songs. “Mehlon Ka Raja Mila” is such a beautiful song ! Even Rafi saab’s song “Miley na phool to kaanton se dosti kar li” (translates roughly to “since I did not get flowers to make for friends, I made do with thorns…this is how I have led my life”) is lovely. I remember all these songs from my childhood – just did not know they were in this movie. Lyrics are terrific and the music is a fitting farewell gift from Roshan saab. Am off to listen to “Mehlon Ka Raja” now. :-) Thanks for another excellent review, Greta. I must mention that the lyrics are by Kaifi Azmi. Much like with Sahir (and I would say even Neeraj), you should be happy when you see the name Kaifi Azmi as the lyricist. His poetry was of very high quality, as songs of Haqeeqat, Heer Ranjha, Pakeezah, Hanste Zakhm and many others out there showcase for us. Such a wonderful film, I feel lucky indeed to have seen it. Thanks for bringing to light this gem. I like what I have read and so will definitely watch this film. I do remember the songs though, especially ‘mehlon ka raja…’. IIRC the melody had a sadness to it while the words sound happy. I wish Zaheeda had been successful in her filmi career. Yes, her resemblance to Nargis is startling. 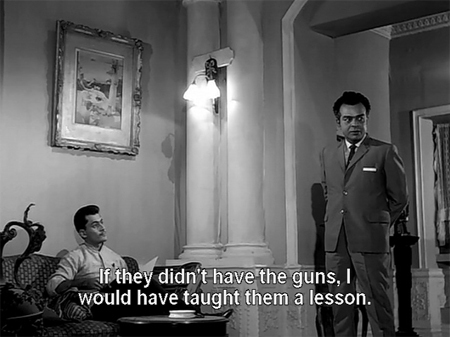 And of course Sanjeev Kumar and Parikshit Sahni. I wish he too had been a success. He had looks personality and could act well, and yet. AND they had connections too. There’s just no figuring out the vicissitudes of fate! I saw Gambler a long time ago; I should rewatch it as I don’t remember much about it. I get goosebumps everytime I listen to “Oh re taal mile nadi ke jal mein” and it pleases me inordinately to know that childhood friends Roshan and Mukesh made beautiful music together till the end. One clarification on the lyricst front – Kaifi Azmi only wrote the lyrics for “mile na phool”, the rest of the songs are by Indeevar. Sadly, your recollection and interpretation are both correct. :-( That’s the main reason why I can’t say I like “Anokhi Raat” – too much of the plot rests upon (implied and visible) exploitation of and violence against women. This isn’t a repeat watch movie for me. My take on it though was that a big part of the message was condemnation of that exploitation of women. Prema was really the tragic figure in this (along with Gopa of course)…she doesn’t really appear to have a way out (and it’s very clear to me that part of her duties as “wife” include “entertaining” the old man’s friends), although in my little world of made-up endings I decided that Rama and her grandfather (and the Painter if he and Rama get married, also part of my made-up ending) take her in and banish Rai Sahab and Madan and their slimy lawyer from the premises forever and get her divorced from Rai Sahab. I know that probably isn’t what I’m supposed to take away from it, but you can’t stop me!!!! Bwaaa-hahahaaaa! Works for ME!!!!! (although perhaps a series of worsening strokes causing him lots of pain would be a little better). Yes, it is a lovely film. Lovely songs too. if you liked Zaheeda here, you should watch Gambler too. She looked really good in that film. Very sophisticated and ladylike. Wow..this seems like a great movie. Will try and get my hands on it. Looks like a thriller \ morality play. Roshan – of course, was the master and the music here is proof. One more song mention – “meri beri ke ber mat todo” – one of my fav Asha Bhosale songs. The things she could do with her voice!!! And Aruna Irani – so young! And the resemblance to Nargis – never saw that before. But the closeup screen cap that you have up there – we can see Nargis’ face there. Oh superb film…thanks memsaab for posting this sizzling film….i loved this film….i dint know that Zaheeda was Nargis’s niece..thanks for the information..but really she looked a bit like Nargis in some places….while watching this film with my mom and granny we were discussing that she is may be the daughter of Nargis (in a joke of course)…but i dint know that the joke will become a bit true..feeling very amazing..thanks really for this information….i have only seen this movie of her…did she appeared in any other film…?and i dint know that this was Roshan’s last film…very sad…he was a superb music director..he made some some superb qawwalis….He was the Qawwali king…. And rumor has it that Nargis is Indira Gandhi’s cousin, Nehru’s niece and Motilal’s illegitimate grand daughter. For some reason, I completely believe this rumor. As with so many early Bollywood, Kollywood actresses, Nargis comes from a tawaif background. Some others are Nutan, possibly Vyjayanitmala, MS Subbalakshmi and even Hema Malini (from her mothers side). It was natural for a tawaif/entertainer to move on to entertaining in front of a camera. Oh and let us not forget Gauhar Jaan–it is a generic tawaif name–and there was at least one Gauhar Jaan in Bombay Talkies. So it appears they got the Gauhar jaan character in Pakeezah right. Nutan was the daughter of actress Shobhna Samarth and director Kumarsen Samarth. Thus was from illustrious family. Not a tawaif. While Vyjanthimala’s mom side had connections with the Mysore Rajas, Hema’s mom is a thoroughbred Iyengar lady from a typcial Iyengar family – no tawaif connection there! Aruna was wonderful in this. Very beautiful too, so young and so sad-looking throughout (appropriately!). 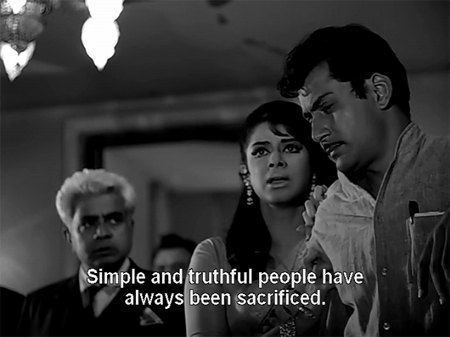 P.S Zaheeda was I believe Chetan Anand’s unofficial 2nd wife – explaining why she did so few movies. Some years back, she died and a FIR was lodged against Anand’s kids for doing away with her for the sake of property. I don’t know what happened after that. Now if the sons had been well-known actors they might have gotten off. There are many stories of actors getting this preferential treatment. Tanuja, who according to Rajesh Khanna drank like a man and smoked like a man, once ran over somebody with her car. She moved to Calcutta after that and the matter was forgotten. I don’t blame Sunil for mixing up Priya Rajvansh and Zaheeda – they’re equally po-faced. Zaheeda at least makes it look as though it’s because there are Interesting Things going on underneath the surface in the few movies she did. Of course, it’s part sympathy: For the longest time I thought it was Zaheeda in the Rajesh Khanna/Hema Mailini reincarnation hilarity-fest Kudrat. It’s not really their looks that make you confuse them… it’s their total lack of expression. They’re both tall, statuesque ladies with faces out of a painting. I know cherry and walnut are two different types of wood, but at the end of the day, it’s wood, you know? Have you seen Heer Ranjha with PR and Raaj Kumar? you MUST. Well there’s also Kudrat, same principals (kinda) with reincarnation bonus! In any case you are always welcome to ask me what I’m smoking :D I don’t mind! Ha ha! You’ve never met Gemma. No need to search to know what SHE is thinking! >There’s just no figuring out the vicissitudes of fate! Your observation about the music, black &white photography & stunning close-ups is apt. Although, personally I think, Asit Sen was not at his best in this film, he almost never lost control of the craft of film making. My father enjoyed working with him. Dad loved the way he composed the shots, particularly the low-angle close-ups. It lent a dramatic element to a scene. Asit Sen was a successful director in the Bengali film industry & was at his best in Bengali films. Kamal Bose the cinematographer of Anokhi Raat won the Filmfare award for best black & white photography for this film. He belonged to the Bimal Roy School of film-making. He was assistant in the cinematography division at New Theatres (Calcutta). Here he met Roy who was the cinematographer. Later, when Roy became director & went on to establish Bimal Roy Productions in Bombay he employed Kamal Bose as cinematographer. 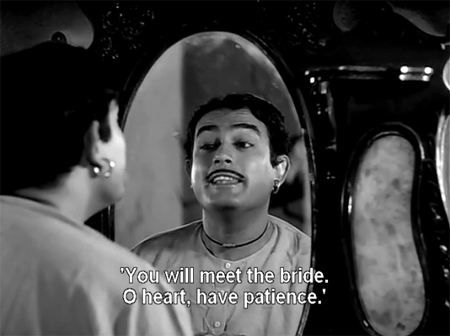 In fact in Roy’s Bandini you see Bimal Roy the director, Kamal Bose the photographer & Nutan the actress at their best. Roshan passed away during the film’s production. ‘Mehlon’ was therefore recorded under Ira Roshan’s supervision. She used to assist her husband in fact you will find her name in the film’s credits. Yes, Ira Roshan is credited as an assistant or associate music director—I figured she had helped out after he passed away. Thank you Shilpi for all this insight into the background; I truly loved this film. 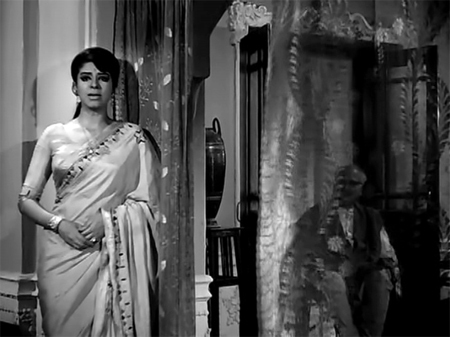 Kamal Bose’s cinematography was gorgeous and yes—the framing of the shots really adds to the intensity of the drama. What is your favorite Asit Sen Hindi film? And Bengali film? Ah, thank you for this. For a while there, it seemed to me that I was one of the few people who’d seen Anokhi Raat and found it fabulous! I love this film – music, Parikshat Sahni (woo-hoo! I couldn’t stop drooling! ), Sanjeev Kumar, et al. So beautifully made. And the end is just so right. My favourite Asit Sen film is the Bengali version of “Khamoshi”. It starred the then reigning queen of Bengali films- Suchitra Sen. She was superb in this film. The Rajesh Khanna-Sharmila strarrer “Safar” is also another favourite. To the best of my knowledge they are all antiques. The name of the Bengali version of Khamoshi is “ Deep Jele Jaee”. Roughly translated it means “ I light a lamp”. I hope so too. Another interesting information: Director Asit Sen made an appearance in the Bengali version of “Khamoshi”. Dharmendra played this role in the hindi version. Though he is shown back to camera, the difference between the 2 Asit Sens (actor & director) is evident. Director Asit Sen is slim. I’ve been following your blog for quite some time now and needless to say am amazed by the sheer time you must be spending watching movies and then so painstakingly describing every single detail therein. I loved this movie ‘Anokhi Raat’. 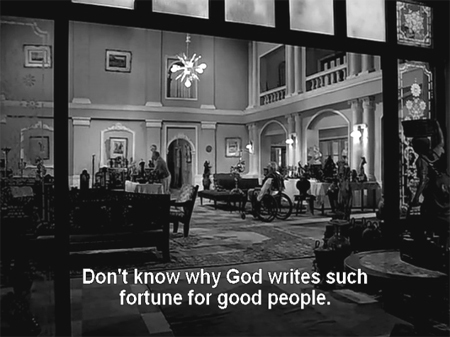 The killer retort that the young Parikshit Sahni delivers to Tarun Bose’s ‘Kaun ho tum?’ is a classic. Also you might have noticed that unusually long single take (without any cuts) when Parikshit sings his song (it lasts for some more than 1 minute I guess). Good to know that there are people who are reviving interest in Hindi cinema and not just Bollywood. Recently there was an interview by Parikshit Sahni. 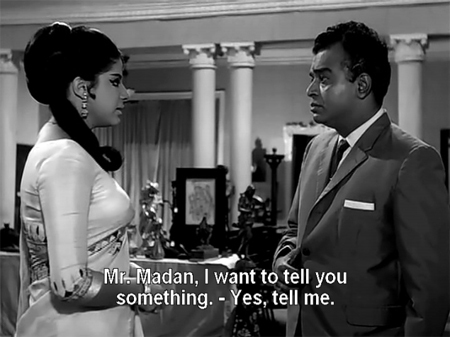 In this movie, he was called as Ajay Sahni as the name Parikshit was considered too scholarly.He said Sanjeev Kumar had suggested his name. Parikshit had a tough time speaking Hindi because he was born in Tagore’s Shanti Niketan where his parents taught and went to Russia at a young age for schooling.When he returned, he got offers. Some of his movies like “Pavitra Paapi”, “Anokhi Rat” and “Samaj Ko badal dhalo” were super hits. But he lacked the charisma of a star. He was more of an actor than a star. Unfortunately, he did not slot himself in the Naseeruddin Shah-Om Puri mould. “Tapasya” and another movie with Rakhee (where the actress was pitted opposite Rishi Kapoor) can’t recollect this wonderful movie name were movies where Parikshit shone as an actor. Sadly, he graduated to character roles much before his prime, moved to TV and slowly faded away before he was resurrected in ” 3 idiots”. I think I read somewhere that he had had a messy divorce and that kind of affected his professional career. Surely, luck was not by his side. Zaheeda had said in an interview with Star & Style (1980) that Nargis had fired her for acting in C grade movies like Anokhi Rat.She quit barely after 7-8 movies.But the fact is Anokhi Rat is an eminently watchable movie even today and makes your heart sink. The movie where Parikshit Sahni does a cameo with Rakhee and Rishi Kapoor is Doosra Aadmi, my favorite movie for Rajesh Roshan’s soulful music. Same Roshan as above but Roshan Jr. Above all, Memsaab you are so good that I do not believe you exist in this material world. Your perception and sensitivity is amazing and humorous at some times. I cannot realize a bad wig or bad make-up in some 70s movie because I just accepted the statu quo and you show a different angle which is true and funny. I have my own reasons to stay hooked to the colorful era when movies were ‘pictures’ showed in ‘talkies’. I was very young growing up when Rajesh Amitabh Vinod Hema et al ruled the screen, but I was obsessed just looking at the movie posters and derive my own imagination on the story line. Like many of my generation folks, as a child, I got to watch pictures only once or thrice in a year. But whenever I got to read magazines like Madhuri, Mayapuri, Filmfare, CineBlitz at the hair salon, I used to register each movie-still in my thoughts and make it a point to watch some day. Now everytime I read your blog you hold my hand walking on that memory lane. One thing sets you apart on the web is that you credit names of supporting cast which I did not know very well by name, like Tarun Bose – I confused myself each time – although loved watching him again and again in Bangla director cinema in Hindi. Doosra Aadmi is on my short list of movies to watch soon :) And thanks for your kind words, I am glad you enjoy traveling back in time when bad wigs and the spirit of jugaad ruled the screen! The supporting cast is so often THE reason to watch a film, too! Thanks Gaby :) I have seen Koshish, but not in a long time. It’s one that I definitely need to revisit! I know this is (too) late Memsahib, but the best thing about this movie has to be “Oh re taal mile nadi ke jal mein”. Guess you missed out due to the language barrier! Most beautiful song with the most beautiful lyrics. One of mukesh’s best songs. I often listened to it while taking care of my brother during his futile struggle with cancer. The lyrics were southing and made sense of the cycle of life and death.